All plaques are hand painted with non-toxic acrylics and roughed up to give an old worn appearance. Hooks are either nickel or white (we match to design colors but you may specify). LOVE this custom ribbon display. 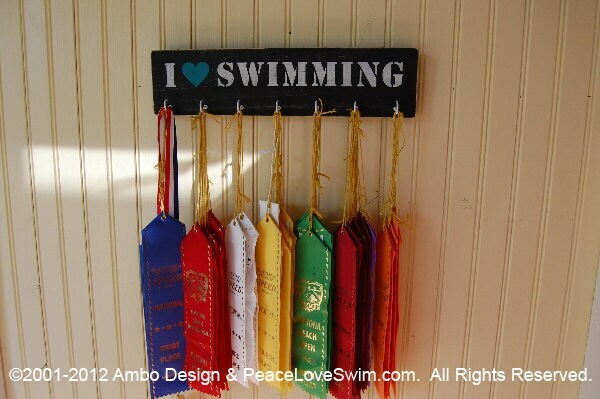 VERY cute design and colors and it really helps us organize the clutter of all those swim ribbons! Quick shipping and great communication. Seller quickly fixed a slight problem, without question or delay. Outstanding customer service! We plan to buy a new ribbon hanger from this seller every year! !